Fellowship Bible is a non-denominational Bible Church in Texarkana, Texas. Dr. Richard J. Hornok is our first pastor and has been the pastor since 1984. Andy Tuttlebee, our student pastor, joined us in 2007. And Justin Leverett, our worship pastor, came on staff in early 2018. For complete list of our other ministry leaders, see below. 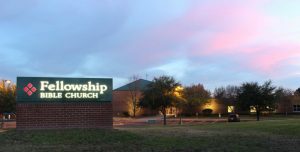 Fellowship’s mission is to help people in the Texarkana area grow in their knowledge and understanding of God and His Son Jesus Christ, through community, fellowship, teaching, prayer and equipping. Fellowship has a strong passion for the gospel, seeing it proclaimed around the world, and supporting those that carry the message and love of Christ. Something else you should know about our church is that we fiercely adhere to the inerrancy of God’s word and its authority in the lives of believers. It is through the Bible that Fellowship derives its beliefs, doctrine, and understanding of worship, marriage, family, and community. It’s the Bible that reveals to us how how each of these areas impact a relationship with Jesus Christ. For more information about our church see our homepage or call our office!